When we set out to become keepers of honey bees, there are numerous facts, methods, tools and repeatable tasks we must master. One of the most important to get under your belt as quickly as possible is learning how to efficiently and quickly find the queen. In this blog post, I’ve compiled notes, suggestions, and advice from several different sources on how to find a queen with my comments along the way. Like any endeavor, successful beekeeping requires paying attention, thoroughly understanding the bee, its biology, its needs and biological patterns so that one can both work along with and also manage appropriately. Too many beekeepers are either intimidated to the point of not trying, settle for hit-and-miss success or have given up altogether. This doesn’t have to be. At the heart of beekeeping success is the well-being of the queen. Although every bee is needed, along with their many vital tasks, the colony most acutely rises and falls with the fate of the queen. A colony can lose a few hundred workers or drones and feel little ill effect. But, lose the queen, and the colony descends into an uproar in literally minutes. Even newly initiated beekeepers intuitively understand the need to at least keep tabs on the status of their queen. We set out with good intentions and even careful study, but, as is the experience for many, actually finding that elusive queen without harming her, the hive or yourself in the process can be a daunting task. There is hope, don’t give up. You can do this if you are determined to do so. Hopefully, the following information will help you get over the hump and further along the path to becoming an excellent beekeeper! I keep a wide variety of apiculture books on my shelves at home. I turned to a few of these first to find the comments below. I have attributed each with the author’s name and a link directly to Amazon if you have interest in the book. This is my experience. Rarely does this not pan out. After reading this again I realize the impatience that typifies my usual inspection process. I need to slow down and take Miller’s advice. It can be a mental hurdle learning to trust your eyes. I often find queens in my peripheral or without really “seeing” her, if that makes sense. You are training your senses to spot the typical pattern, shape, color difference, movement, etc that is the queen. So, it is a balance of moving through the hive efficiently, with a process, but not too slowly. Not spending too much time per side of each frame but moving on and trusting the eyes. This takes practice and testing and trusting yourself. Interestingly, and with a twinkle in his eye, Miller describes how his wife, on the other hand, likes to go very slowly and detests having to go over comb more than once. In her case, he acknowledged she was better at it than him. Either way, Miller suggests going through a colony more than twice not worth the time and better to close it up for another day. I concur. Good advice. One need remember that you can ascertain the quality of a queen and the colony by looking quickly at a few frames to assess the presence of eggs, in a good pattern, etc. You can also sabotage their own efforts by needless jarring, noise, scents, etc when doing an inspection. We make it easier on ourselves when we are gentle, quiet, and without offending odors. Then, pulling the outermost frame or so is vital to ensure the safety of the queen. 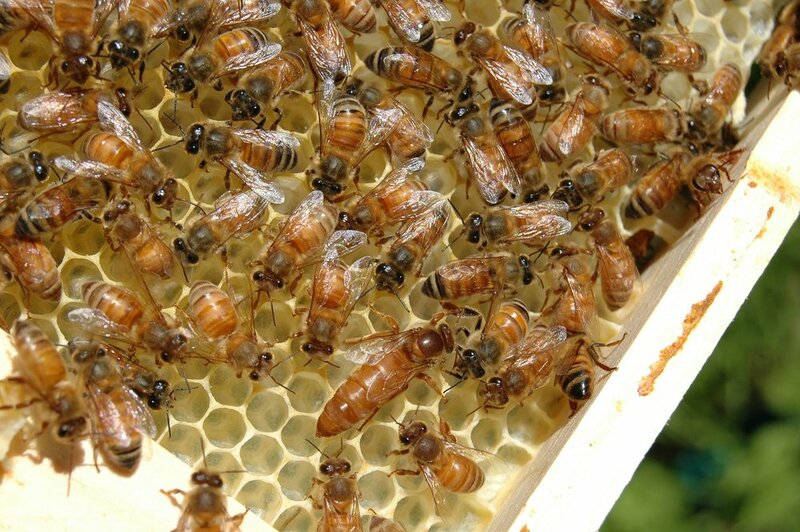 It is common for new beekeepers to injure the queen (easy to do) by rolling or crushing her between frames. This to me is one of the most important tactics: playing the odds. A queen’s job is laying eggs. She does this for the most part without ceasing. If you want to find the queen, find eggs that were just laid. She’ll not be far-either on that frame, those next to her or straight up or down. As you become more adept at spotting a queen, this pattern will become more readily perceived. Not just the pattern of the workers around her, but her very shape and lumbering movement. Another idea from Diana Sammataro and Alphonse Avitabile: you can put a queen excluder between the two brood chambers if this is your setup. Four or five days later, the queenless box will have no eggs. There are other variations on this theme. Use the general principle to your advantage. And, as already mentioned, just smoke very lightly to calm and distract the bees but not so much as to irritate and run the queen. Simple, but specific details that can’t be skipped. This is my practice. It’s simple and one doesn’t need to buy any fancy equipment to hold frames. It hurts nothing to quickly scan the first frame for the queen and then lean it gently against the hive around the corner from your feet so that you don’t accidentally kick it. Do this quickly and efficiently and help yourself get to the brood area as quickly and smoothly as possible. What’s not usually mentioned in books I read are practical next steps. I generally quickly but very gently break apart the next 3-4 frames, prying them apart a bit to give enough space to see where brood begins. I then attack that area first. This saves much time, gets me to the brood quicker, and gives less time for the queen to move about. I want to catch her before she might jump down to the deep below, for example. We typically employ this tactic on our second time through the brood if we didn’t find her on the first pass. In a full-strength colony with maybe 2-3 deeps, I’d hazard a guess that we usually find her in the first pass about 75% of the time, within 3 minutes or less as a general rule, sometimes much quicker (especially if a smaller colony). Bush reminds the reader that it’s really not necessary to find the queen every time you enter the hive. I completely agree. One searches for the queen only intentionally when you need to remove or dispatch her, etc according to pre-determined management needs. I like Michael’s description of a queen’s movement on the comb. Michael rounds off his discussion on spotting queens by encouraging the keeper to have a proper mindset. Just a cursory look for a queen without believing she’s there isn’t helpful. Trust the process and remember she’s there and you’ll find her. And, like anything else in life worth pursuing, this takes practice. I trust this information is helpful to you. Pass it on to other new beekeepers who may be struggling with this important skill.